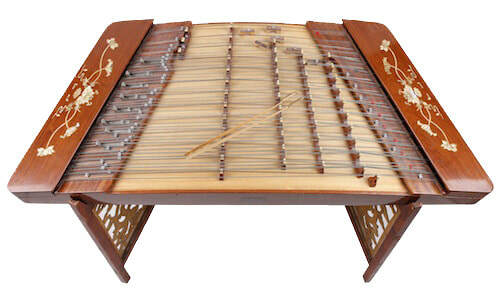 The Yangqin 揚琴 is also called a hammered dulcimer. It is played by hitting strings with a pair of bamboo mallets, with the size of a chopstick. This produces a high and tinkling timbre in its top registers, a soft and beautiful tone in the middle and a strong rich sound in the lower registers. The metallic tone resembles the harpsichord. 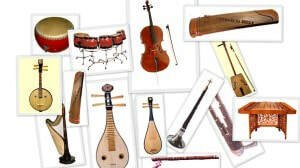 It has the widest range of scale amongst the Chinese plucked-strings instruments (about 5 octaves). It is also a chromatic instrument. In the orchestra, the yangqin often adds to the harmony by playing chords or arpeggios. The ends of the sticks can also be used to pluck the strings, producing a crisp and clear tone quality. The yangqin is also sometimes called the “Chinese piano” as it has an indispensible role in the accompaniment of Chinese string and wind instruments.